This report is based on data from the Canada-wide Gender-Affirming Surgery Experience Survey. The survey was originally designed through a partnership between the Stigma and Resilience Among Vulnerable Youth Centre (SARAVYC) at the University of British Columbia and Trans Care BC, and resulted in a first report focused on British Columbia, which was published in October 2017. After hearing about this work, three Toronto-based healthcare and research centres contacted SARAVYC about compiling a report based on the Ontario-specific data collected in the survey. They include the Centre for Addiction and Mental Health (CAMH), Sherbourne Health Centre (SHC), and Women’s College Hospital (WCH) and will be referred to in this report as the Toronto Partners. Through funding from the Toronto Central Local Health Integration Network, the Toronto Partners are working to enhance the coordination and availability of health services and supports for trans and gender non-conforming people throughout Ontario (ON). Launched in July 2016, the survey had 751 respondents and was open to anyone residing in Canada who had undergone assessment and/or surgery in the last five years, capturing people’s experiences since 2011. After partnering with the Toronto Partners, SARAVYC focused recruitment efforts for a second wave of the survey in Ontario, and translated the survey into French as well. The survey asked trans people at various stages of accessing gender-affirming surgery about their experiences with the process, including their experiences with surgery readiness assessments, surgery, and post-surgery recovery. Coronel Villalobos M, Stiegler S, Frohard-Dourlent H, & Saewyc E. (2018). 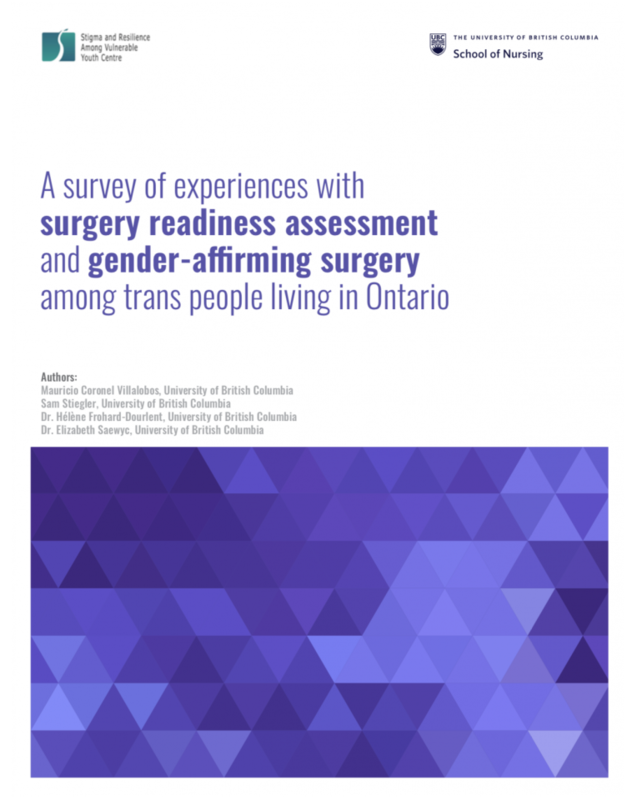 A survey of experiences with surgical readiness assessment and gender-affirming surgery among trans people living in Ontario. Vancouver, BC: Stigma and Resilience Among Vulnerable Youth Centre, School of Nursing, University of British Columbia.